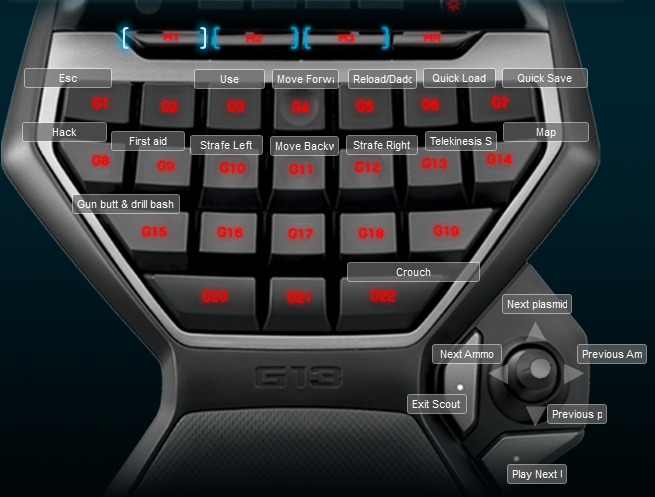 BioShock 2 has a few default profiles for the Logitech G13. I didn’t like any of them so I created my own. I used the joystick for ammo and plasmid types, I am not sure how useful those will be, but it seemed like the best spot. I put telekensis and first aid as the easy to reach keys after the WASD movement keys because they seem like you would use them more in combat. I put zoom and jump on my extra mouse keys. I can’t see a need for a seaparate multiplayer profile. This one seems to cover the most used keys. Below is a screenshot of the keyboard layout.